This gravity painting activity for kids combines science and art to demonstrate the force of gravity in a STEAM-filled project that promotes creative thinking. Add colored tissue paper to turn it into a beautiful spring artwork. Post by Jamie Hand. Combine science and art to demonstrate the force of gravity in a fun art project for kids. This STEAM-filled activity will have your child thinking creatively and becoming a problem solver. STEAM is the combination of Science, Technology, Engineering, Art and Math. Hand Made Kids Art believes the inclusion of the Arts to STEM is essential to our children’s future success. Teaching children how to think creatively and learning to be problem solvers is how we can prepare our children for the future. No matter what unknown technologies, industries or careers lay ahead, creative problem solvers will be the innovators in their field. With STEAM activities the final product of the activity is not as important as the process. Through the process of experimenting and exploring your child is using creative and critical thinking skills. Scientists, mathematicians, engineers and artists all use the same critical thinking skills to find new and innovative solutions. Activity Challenge: Use the force of gravity to create a work of art. Gravity is what keeps people and objects on the ground and causes objects to fall toward the Earth. Give examples (apple falling from tree, pencil falling from table, etc). Gravity Painting is using the Earth’s gravitational pull to direct the paint. To see an example of gravity painting, check artists like Amy Shackleton. It is amazing the result she gets without using a paintbrush. Prep your work space with a drop cloth and an easel or support to hold your foam board. Mix your paint with a splash of water. You want to water down the paint so it can flow easily down the paper. Drip the paint on the paper with a pipet (medicine dropper) or spoon. My two young artists enjoyed using the spoon to get good size drips. Watch gravity do it’s work. Your artist may wish to manipulate the drips by turning the board as the drips run down. Once your paper has dried, ask your child “what you can turn the drips into?”. You may wish to turn your painting upside down or on its side to spark an idea. Use your imagination to think creatively about what you see in the drips. Add color and creativity to turn your drips of paint into a work of art. We used one of our favorite collage techniques by painting with glue over tissue paper. You could also paint or add color with markers instead of creating a tissue paper collage. My three year old, M-Woww recently learned about flowers at preschool and immediately wanted to turn her drips into a flower garden. We cut petals out of tissue paper (I did assist her with this task) and she thoughtfully arranged the petals to create her flowers. As she worked we discussed the different parts of the flower and combined science learning with her art. My five year old, Lil B, wanted to make his painting into grass with bugs and insects. He started by layering green tissue paper to create grass. Then he got the idea to add dirt and insects underneath the ground. Finally, he drew details with permanent marker for his insects and bugs. As he worked, we discussed what an insect was, what body parts they had and what type of environment they live in. Ask your child questions along the way to stretch their creative and critical thinking skills. The great thing about process art is there is no wrong way to do it. Let your child lead the project with their imagination. As with any scientist or artist it is important to reflect upon the project, even for young artists. Lil B decided that next time he wanted to use blue paint for the gravity painting so it would look like rain in his painting. M-Woww decided that she wanted to add blue to the background to represent the sky. To us, Art naturally fits along with Science, Technology, Engineering and Math. The fusion of these core subjects helps produce innovative and creative thinkers and problem solvers. For more STEAM ideas check out our Pendulum Painting, Simple Machine Brain Drawing or Build a Rain Shelter Engineer Challenge. Jamie is a certified Art Instructor and a mother of three. Her website, Hand Made Kids Art, focuses on quick, easy and inspiring art activities to grow creative kids. It doesn’t matter if you only have 5 minutes or 20 minutes, you can find time to create art with your children. 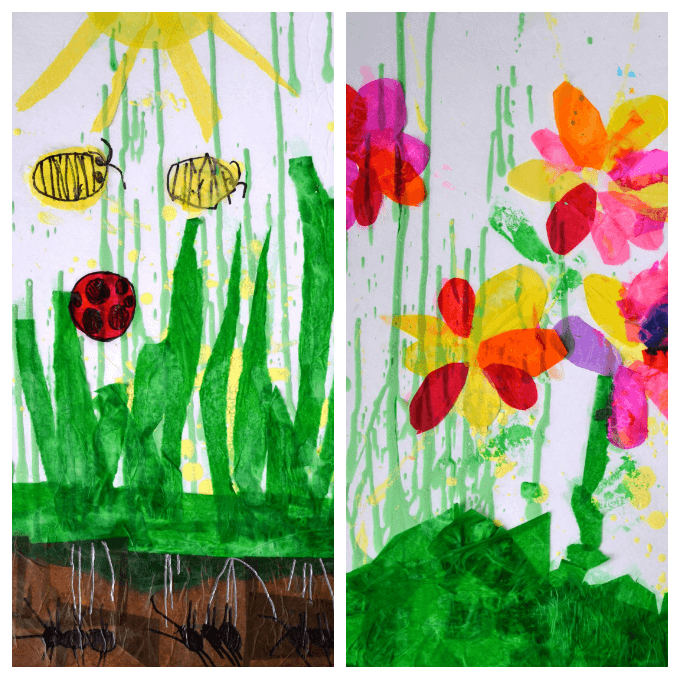 You can follow along with her art adventures at Hand Made Kids Art. Thank you so much for this! I love being able to teach my kids art and science at the same time. I shared this post with my friends on Facebook today. Thanks for sharing ” Gravity Painting – A STEAM Art Project for Kids” . This is very nice . I’m quite impressed with your blog.